AmeritexDirect wants your boat to have the best-looking canvas in the marina, or at the launch, or anywhere else your boat goes. 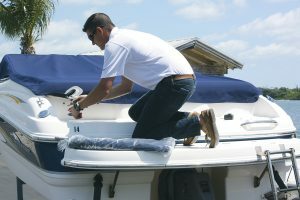 Moreover, we want to make sure you and your boat are adequately protected. So, we’re here to help you install your canvas once your order arrives, and ensure that it fits like a glove. On this page, you will find some helpful information to that end. Ordering canvas from AmeritexDirect has many benefits: A significant savings relative to having your canvas entirely custom made. Superior fit compared to the generic canvas that you can purchase online or at a local marine retailer. Exceptional protection from the elements to help best preserve the investment you have in your boat. The list goes on. However, if you order snap-on canvas from us — such as bow covers, cockpit covers, or most curtains — these items will arrive without snaps on the canvas. The simple explanation for this is that, most likely, your boat had old snap-on canvas that you are now replacing. We have no way to know where the boatbuilder placed those original snaps. They tend to vary an inch here or there, according to what will make the canvas best fit your boat (more details in our FAQ section). You have a few installation options described below, but if you don’t find the answers you’re looking for, please contact customer service and they will be happy to help. Ameritex Fabric Systems recommends that all replacement canvas parts be installed by a knowledgeable professional. This will insure that your new canvas has the same fit and finish as the original did on the day they delivered your boat, as well as maximizing the length of time over which it will retain this superior fit and performance. Your local dealership will most likely have a professional on staff that can install your new canvas at a reasonable cost. If your brand doesn’t have a dealership in your immediate area, then local custom canvas shops will have the proper tools and should easily be able to assist you. 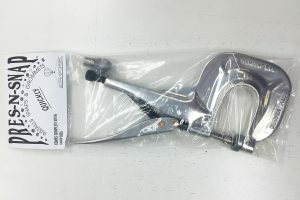 If you are the DIY-type, you can purchase the required snap tool from us by emailing our customer service team. We are currently producing a series of helpful instructional videos. As soon as we complete them, they will be posted on this page. In the meantime, we are happy to offer any help that we can.